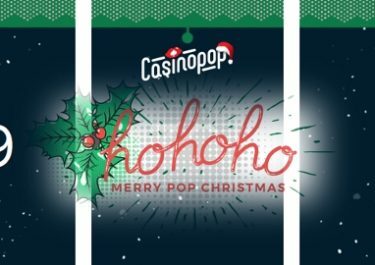 CasinoPop – Theme De Pop! Win a share of €2,500 in cash and prizes! Racey week happening right now at CasinoPop with daily tournaments running on differently themed slots. A daily prize pool of Epic and Free Spins will reward your daily effort while an overall leader board will award cash prizes to the TOP15 spinners throughout the week. Play now some of your favorite games to take home the first prize of €500 in cash. Compete for a share of prizes worth €2,500 in CasinoPop’s new tournament named Theme de Pop! Running from 25th May to 1st June 2018, they will hold tournaments, every night at 18:00 CET. Play your favorite slots to climb the leader board and win amazing prizes. Every day they present a new theme which can be used to collect extra points that will increase your chances to reach the top of the leader board. Turnover and win in any slot, and you will get the points needed to quickly advance. The tournaments run every day between 18:00 – 23:59 CET throughout the promotional period. To place on the leader board, players need to wager on any game plus they can earn extra points for playing the daily selected themed slots. Earn one point for every €1.00 | €10 wagered on slots | table games. The themes of the week are Friday – Speed | Saturday – Adventure | Sunday – LOL! | Monday – Fruits |Tuesday – Hard Rock | Wednesday – Space | Thursday – Soccer | Friday – Pirates. The TOP5 scoring players of each daily race will win a share of the prize pool, credited on a selected game shortly after the tournament has ended: 1st – 150 Epic Spins | 2nd – 100 Epic Spins | 3rd – 75 Epic Spins | 4th – 50 Free Spins | 5th – 25 Free Spins. Epic Spins have 3x the value of Free Spins. The TOP15 scorers throughout the week will win a share of a separate cash prize pool: 1st – €500 | 2nd – €300 | 3rd – €200 | 4th & 5th – €80 | 6th to 10th – €50 | 11th to 15th – €30, credited with no wagering requirements within 24 hours.